Over 37 million Americans struggle with some form of hearing loss. If you’re among them, then we know that you’re anxious to learn more about your hearing aid options. Although some people who are hard of hearing might think that surgery is a better option, the wonderful truth is that hearing aids can improve hearing in up to 95% of patients. This means that, with the right types of hearing aids, you may be able to avoid surgery altogether. Of course, with so many different hearing aid style, it can be tough to find the perfect pair for you. In general, the best way to find out which hearing aid option you should go with is by meeting with your doctor and scheduling a hearing test. However, in order to make things a bit easier for you, we’ve created this handy guide to the different types of hearing aid options. Let’s start by discussing one of the most common types of hearing aids: behind the ear, or BTE, devices. The actual technology used to help you hear is housed in a plastic (or other kinds of material) casing that is, as the name implies, placed right behind your ear. The sound is amplified by a small plastic tube that runs sound into an earbud inside of your ear. So, this means that the tube will likely be visible, and in some cases, so will the actual technology behind the ear. BTE hearing aid options are usually best for people who are dealing with a moderate to severe amount of hearing loss. They can help those with tinnitus, those who hear echoes when they speak, and many other common hearing issues. These hearing aids are also popular. This is because greater distance between the microphones and the receivers means far fewer feedback issues. It’s also durable and long-lasting and generally won’t require lots of repair and maintenance. If you’re looking for the most “one-size-fits-all” option, this is it. However, be aware that it’s a bulkier model than other hearing aid types and more visible as well. You also might feel that it’s not as comfortable as some of the other options on this list. And maintenance, as we mentioned, is minimal. But be aware that you’ll still need to switch out your ear tips and tubes somewhat frequently. Next up on our list of hearing aid styles, is the receiver in canal hearing aids or RIC hearing aids for short. In this model, the receiver gets placed inside your ear canal. While BTE models use plastic tubes, RIE options tend to go for small electrical wires when it comes to carrying sound. This helps to eliminate distortion. They work best for those who are experiencing a less severe degree of hearing loss. They’re one of the most comfortable types of hearing aids, and they’re also much less visible the BTE options. In some cases, you may need to have your ear molds re-fashioned every few years to ensure no harm comes to the acoustic seal. Also, you’ll have to change out the receiver and the ear tips fairly frequently. They require a bit more maintenance than BTE hearing aids. But for many, the level of discretion they offer makes the extra care well worth it. Again, keep in mind that much of the hearing aid device you choose depends on your personal preferences and unique hearing needs. When in doubt, prioritize function over form. If you’re in the market for a custom-made hearing aid, then the completely in-canal, or CIC model, will be the best bet for you. This is one of the most discreet models possible. In fact, all that’s usually visible is the tiny handle that you use to put the device in your ear or to remove it. Of course, it shouldn’t come as much of a surprise to learn all that customization comes with a bit of a higher price tag than other models. Additionally, this model works well with telephones. So, if you find that your current hearing aids work well when you’re “out in the world,” but less well when you’re making a call? You might consider making the switch to the completely in canal option. Especially if sound location is your priority, these also might be the right choice for you. The work with your outer ear to help amplify sound, so you hear much more clearly on the phone and in your daily life. However, be aware that, as with every model, there are a few drawbacks. We’ve already mentioned the higher cost, but this type of hearing aid can also be a challenge when it comes to changing the batteries. You may also experience a bit more feedback with this type of hearing aid than with the others on this list. Some people have also reported dealing with occlusion — occasional echoing sounds when speaking — when wearing this kind of hearing aid. Keep in mind that if you need to use a directional microphone, they aren’t compatible with this design. Again, it’s all about what you choose to prioritize and what you can and can’t live with. Now, let’s take a look at in the canal hearing aids, otherwise known as ITC hearing devices. These are the hearing aids that are created in a flesh color that matches your own skin tone and that are placed inside the ear canal. Be aware that a part of the hearing aid will be visible in your outer ear. However, unlike with some of the other hearing aids on this list, you won’t have any tubes behind the ear or wires running over the outside of your ear. For many, they’d much prefer the comfort of an ITC hearing aid than the bulk of a BTE option. Plus, the small size of in the canal hearing aids also means that they’re lightweight and comfortable. Of course, it also means that they’re a bit more delicate than some of the heftier devices on this list! In the canal hearing aids are an excellent option for those who are looking for help in dealing with tinnitus. If you’re struggling with this irritating ringing in the ear, an ITC option would likely be the right fit for you. ITC hearing aids are also compatible with dual microphones. However, the complications with ITC models are often due to something you have no control over: the size of your ear canal. The unfortunate reality is that, if your ear canal is too large or just oddly shaped, you won’t be able to wear ITC hearing aids. And really, you don’t want to deal with them slipping in and out of your ears all of the time. Be aware that these also won’t work for those who produce a large amount of ear wax. This is because an ITC model can get easily damaged by moisture and wax. Now, let’s talk about another one of the types of hearing aids that could be right for you: in the ear, or ITE, hearing aids. These, as the name implies, have a shell that goes in your outer ear. They’re easy to adjust, and, like a few of the other options on this list, customizable. They work well for people across a broad range of the hearing loss spectrum. So, whether you’re dealing with mild or severe hearing loss, don’t rule these out just yet. Because the hearing aids will be visible, they come in lots of different color options. This way, you can find a shade that matches your skin tone. Or, you could also have fun with a more unexpected color choice. This is an excellent option for those who need twin microphones in their hearing devices. This means that you’ll enjoy one of the highest levels of clarity of any hearing device on this list when you choose ITE hearing aids. However, they are on the larger and more conspicuous size. Also, as with the ITC options, if you have an issue producing lots of ear wax, these may not be the best choice for you. Again, this is because they’re damaged with ease by any amount of moisture and wax. You will also need to do a bit more maintenance on ITE hearing aids than you might with other models listed here. You should clean them every day in order to avoid shortening their lifespan. It’s possible that you’ll experience issues with feedback due to the close proximity of the microphone and the receiver. So, you’ve now learned about some of the most common types of hearing aids, as well as the pros and cons of each. But before you make your final decision about which one is the best fit for you, be aware that you need to think about the kinds of features your hearing aids have to offer. 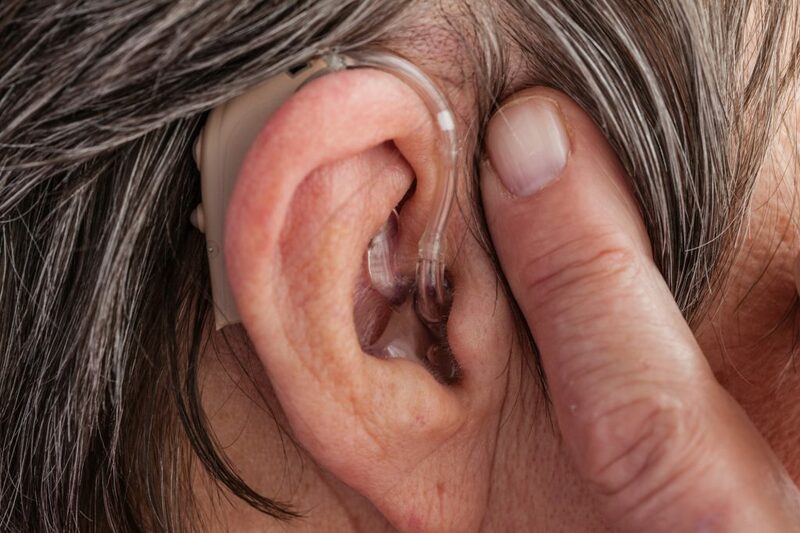 No industry, not even the hearing aid market, has been immune from recent advances in technology. This is even truer when it comes to the rise of smartphones and apps. This only improves the experience of wearing hearing aids for many people. You’ll be shocked to learn what you’re now able to do with a few quick taps on your smartphone. For example, let’s say you’re in a crowded area and need to be able to filter out a bit of background noise. If you choose a hearing aid that has a corresponding app on your smartphone, with the click of a button, you can adjust your settings. This means that you’ll no longer need to take your hearing aid out of your ear to make adjustments. But perhaps you’ve tried to make a couple of adjustments on your app, and you’re still not getting the level of sound quality you need. Be aware that many hearing aid apps actually have hearing consultants on hand. This means that, when you’re struggling to hear, you can actually describe both your surroundings and your problem to a hearing expert. They can help to give you advice, allowing you to find the ideal setting for your current surroundings. Apps also help you with adjusting settings when you’re making a call on your smartphone. In short, you’ll be amazed by just how much is possible when it comes to smartphones and hearing aids. So, before you choose your hearing device, do some research on the kinds of apps available for use. Want to Learn More About Other Types of Hearing Aids? We hope that this post has helped you to better understand the most common types of hearing aids on the market today. When you’re choosing your device, think about what will make you the most comfortable, while also providing you with the hearing solutions that you need. For example, you might want a hearing aid type that’s more discreet, or you may need a device that allows for a dual or directional microphone instead. No matter which kind of hearing aid you end up deciding on, we know that you want to make sure you’re getting a high-quality and well-rated option. That’s why we’re committing to reviewing some of the most popular types of hearing aids on the market today. Keep checking back with us to learn more about the kinds of devices that could work for you. We can’t wait to help you hear more clearly every day.